by Dave from The Longest Way Home ~ May 12th, 2015. Updated on January 22nd, 2018. Published in: Travel blog » Nepal. On Tuesday May 12th (12:35 local time), just over two weeks since the first earthquake, a second major (7.3) earthquake hit Nepal. The earthquake struck in Kodari about 22 kilometres southeast of Zham in China along the Nepal border. Areas such as Namche Bazaar and Everest Base Camp are also directly affected. It was 83 kilometers from Kathmandu city which suffered more collapsed buildings and fatalities. Namche Bazaar is an old trading route between Tibet and Nepal. It’s also one of the major stopping points on the way to Everest Base Camp. 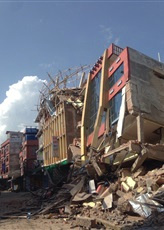 The earthquake was felt in Kathmandu where several already damaged buildings collapsed. Electricity was cut off and all of Nepal’s telecoms became jammed. So far casualties in the major cities have been relatively minimal. Nepal was well on the road to recovery after the previous earthquake. International & national aid was reaching remote villages and unsafe buildings were being taken down. Nepalese people were returning to their normal everyday lives when the second earthquake hit. The second earthquake occurred in the afternoon of a normal business day. People were inside buildings that had already passed inspection and the previous earthquakes might. 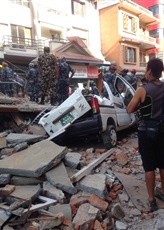 Casualties in Kathmandu city, Bhaktapur and Patan were minimal. Though there were deaths in each city none went over 40 65 115 reported dead. Injuries reported to hospitals were higher in number at 1,117. In the villages of Kodari district it is a different story. They were largely spared from the previous earthquake. They are now at the new epicenter. Landslides and casualties have been reported. Dolokha is reporting a school collapse. US Ospreys and other choppers flew within the hour to Ramechhap. Numbers of casualties may be a far less than the 8,500+ people killed in the previous earthquake but the long-term devastation to the Kodari district may be worse. 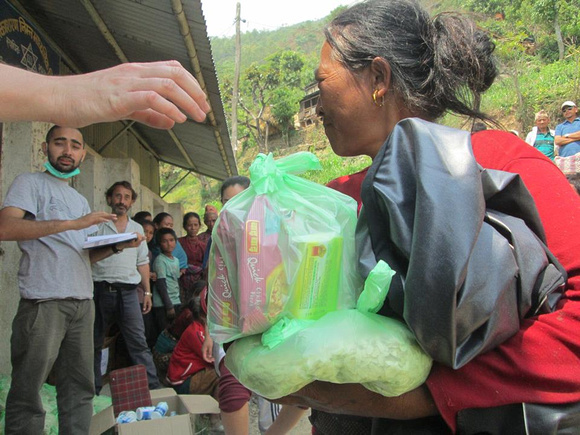 Most international aid organisations are already in Nepal on the ground. There are still rescue teams there. With such equipment and aid at the ready rescues and casualties will hopefully be kept to a minimum. The remoteness of the villages and the terrain makes the operation difficult. What’s more the monsoon rains will soon be here making life even harder. The previous earthquake measured 7.8 according to the Moment Magnitude Scale (MMS). The latest earthquake was measured at a 7.3 magnitude. That does not take away from the fact that this was a 7.3 magnitude earthquake that’s classed as major. It also does not take away from the fact that it hit a remote area. Technically this earthquake is actually a very strong “aftershock”. Much like Langtang in the first earthquake which was obliterated to the point of only one damaged house remaining hope for Kodari is on a razors edge. Who can tell or predict when natural disasters will strike? No one. Nepal’s two in a row is not unprecedented. There is scientific evidence that suggests why it happened. After the first earthquake scientists believed there was still a lot of seismic pressure that had to be released as the tectonic plates settled. Now with the second earthquake it seems this is exactly what happened. Hopefully now that the pressure has been released that will be it. Nepal is on a fault line though and reconstruction in the modern age must include earthquake resistant engineering and materials. Update 13th May: Good news from Namche Bazaar. Though a few houses did collapse the majority survived. Likewise along the Everest Base Camp trail. Here are photographs from Namche Bazaar after the earthquake by the Annapurna Post (Nepalese). The Annapurna mountain range is still open to tourists and there are tourists trekking safely in that region. The Everest Base Camp trek is currently closed as is Langtang. A US helicopter that went missing yesterday is still missing despite occasional reports stating that it was found (update: the helicopter is still missing – source). Airlifts continue to bring the injured down from the Kodari region to Kathmandu for treatment in hospitals there. In the Kathmandu Valley controlled building razes continue for the protection of those around them. Rebuilding has already begun in some areas. It’s just like a few weeks ago but all over again. Don’t let the smaller numbers make you think it’s better. Langtang was wiped out in the previous earthquake while big media focused on Kathmandu. 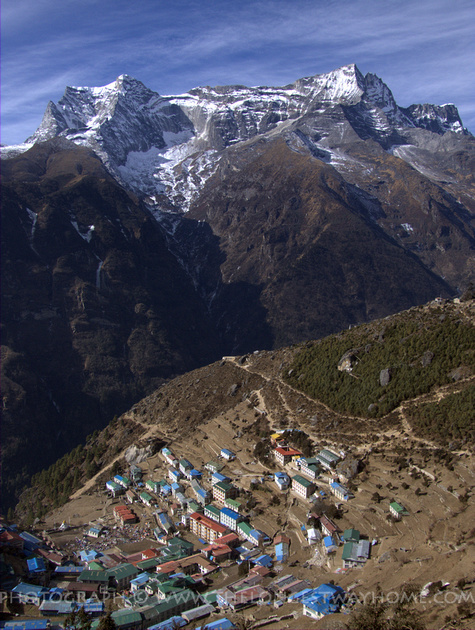 Namche Bazaar and others in the Everest and Kodari regions are facing the same fate this time. Kathmandu International Airport is open to aid flights and they are arriving. The roads around the Valley and villages to the north are severely damaged and this is the main concern: delivering aid where the roads are destroyed. Airlifts and drops will be needed now more than ever. How not to help: Let the professional experts do their job unhindered. The best emergency crews, rescue teams and aid teams are either on the ground or on the way. Let them have 100% support by using the above links and not going yourself. Don’t cancel your future trip to Nepal. It may seem heartless now, but Nepal will recover from this second earthquake. Once it does, the Nepalese people will need you. They are a proud people that don’t want handouts forever. They want to work for a living. Officially 8% of the population relies on tourism, unoffically the number is closer to 25%. Peak season starts in September. All of the Annapurna region is still open to trekkers. As I’ve already written much of Kathmandu Valley’s temples still stand. There’s still a lot to see and do in Nepal. Nepal and the Nepalese people need tourists to return. Yes, right now it is too early. But come September, October, November and December Nepal will be open to visitors again. It is as a tourist to Nepal that you can help everyday Nepalese people survive for the long term. The news is bad today, tomorrow there is a new dawn. Don’t give up hope on Nepal! Comments are off, please use the links above to help or if you are planning to visit Nepal – stay tuned!